SECURITY – WHERE DO YOU FIND IT? Remembering a childhood over half a century ago (okay, I am legitimately old at least in my children’s opinion), we could ride bikes throughout the city without fear. No mobile phone, no texting, no lunch! We find Mayberry’s Andy and Opie humorous and we remember when life was like “Leave it to Beaver” – generally carefree and congenial. But that was then, not now. Security seems to be something that we long for and search after more these days than ever before. For good reason, some would argue … more violent crimes; more terrorist activity; more drug related crimes; more … and the list could go on ad nauseum. I don’t know if there is actually “more” of these activities than in the past, but I do know that these events are more readily visible now. We have our cell phones and ipods with built in cameras that take video of offending activity as it occurs – no matter where in the world it is taking place. Yes, it seems that there is more reason for security measures than in the past. We can hire security firms to put locks and sensors on the doors and windows of the house. We put our valuables in safe deposit boxes. We put our money at the bank. We go to the doctor even though we know that the body is aging and that there is a limit to what medicine can do. In Matthew 6:19, Jesus tells us that we should not focus on gathering treasures here on earth where they are only temporary. Rather, we should lay up treasures in heaven. In short, eternal treasures trump earthly ones every time! In verse 25 Jesus says that we should not be anxious about our life—what we should eat or drink or about what we should wear. In giving these illustrations, Jesus has covered the waterfront of necessities – food, drink, and clothing. He then says that God knows we need such things. If we are not to be anxious over necessities, we certainly should not be anxious over the frivolous add-ons that take up so much of our attention. Our job is to focus on putting our treasures in the kingdom of God. We are to seek His kingdom and His righteousness … and the rest will be added to us from God. Matthew 6:25-34. The writer of Proverbs says “Anxiety in a man’s heart weighs him down, but a good word makes him glad.” (Proverbs 12:25) I suggest that many of us can verify the truth of this statement! Paul says: “[D]o not be anxious about anything, but in everything by prayer and supplication with thanksgiving let your requests be made known to God. And the peace of God, which surpasses all understanding, will guard your hearts and your minds in Christ Jesus.” Philippians 4:6-7. If we do this, verse 6 promises that we will the peace of God guarding our hearts and minds in Christ Jesus. This doesn’t mean that we ignore what we need or what situation or circumstance faces us; we just are not to stress over it. Do we want security? I suggest that we rest in God’s arms. Lose the anxiety and worry; the fret and cares. Hand them to God through prayer and then let Him exchange your cares for His peace. Focus on His kingdom, rather than this world. Snickers asleep on Daddy’s lap. 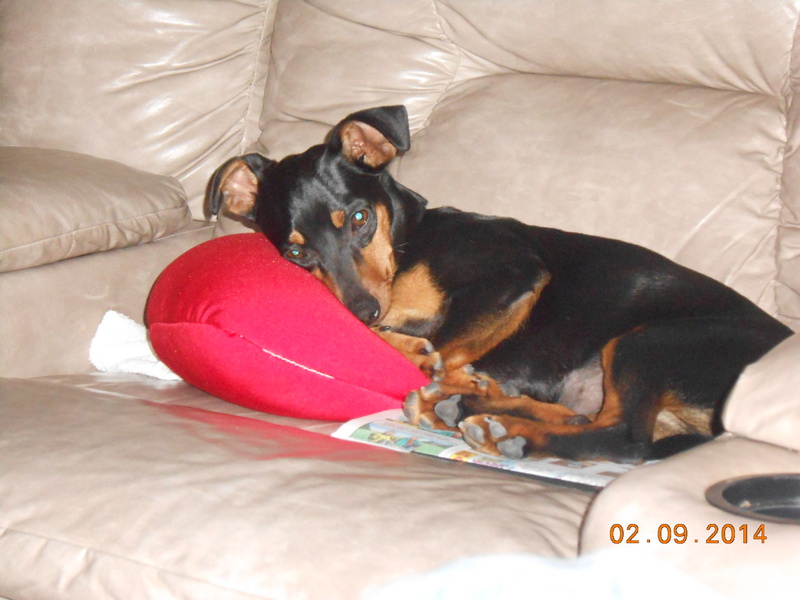 I realize that no analogy is foolproof and I don’t want this to be misunderstood – but when I visualize resting in God’s arms, I can’t help but see it illustrated in our canine children. 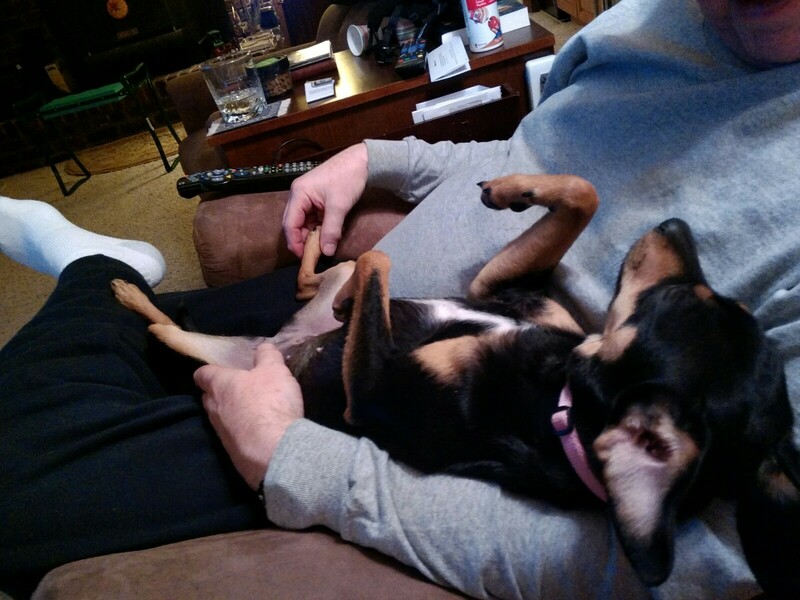 Snickers falls asleep, and snores, when laying on my husband’s lap – tummy fully exposed and head dropped back with eyes virtually glued shut. Vulnerable? Yes. Relaxed? Yes. Scared? No. She is secure in the arms of one who loves her and will care for her. So, the question is — do you trust in things of this world, or in the God who created this world?